Dawn Dimmler at an Airport High School function last year. 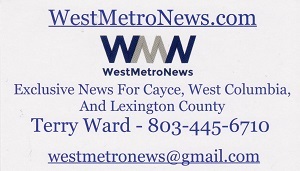 WestMetroNews photo. At a special called board meeting on Monday evening, the Lexington Two School Board announced the immediate termination of a District Two assistant principal. No name or school was given, because the termination involves a personnel matter. The principal of Airport High School is on administrative leave. And Lexington School District Two Communications Director Dawn Kujawa confirmed on Thursday that Airport Assistant Principal Dawn Dimmler was on administrative leave.